Casinohuone Can you dance the Finnish polka? What do you expect from a Finnish casino? Some nice Viking metal on the background? A free pass to the sauna? This would be cool, but Casinohuone doesn’t offer these goodies - as a true Finnish casino, it is available only in Finnish! However, the selection of games is nice (over 400 titles by NetEnt, Microgaming, and some other providers), and the welcome bonus is extremely attractive. As a newcomer, you can get 400 free spins as a no deposit bonus and a 100% welcome bonus, up to €100, with fair wagering requirements of 35 times the bonus. But, unfortunately, this casino has a long list of restricted countries, and its support agents don’t work round the clock. This place has a not bad rating, better than Simba Games Casino, Royal Vegas Casino, or SCasino. However, there are still much better places, like Chance Hill Casino. Decent wagering requirement - 35xB. 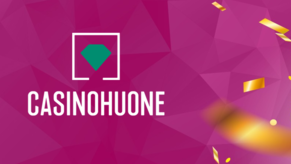 Casinohuone was founded in 2006 by iGame Malta Ltd Casinos. It is licensed and regulated by the Malta Gambling Authorities. The website itself looks nice and tidy, but there is a little problem with it - it is available only in Finnish. So if you don’t speak this language, you won’t be able to enjoy this casino fully. Well, if you are a resident of one of the restricted countries (including US, France, Italy, etc. ), you won’t be too disappointed with the only Finnish language available. The website is available only in Finnish. Your safety is a definite priority for this casino, as they have implemented the industry standard SSL encryption. This ensures that all sensitive data is under strict lock and key, keeping it out of the hands of unwanted individuals. Another benefit is their policy of auditing their games on a regular basis, guaranteeing that your outcomes are always fair and random. The design is just marvelous. If you don’t want to play here, you should at least check those funny and creative banners. Customer support: The customer service is available via live chat - it is open every day, from 09:00 to 01:00. If you can’t find any useful trolls to talk to, then you can always send them an email. FAQ section is there, and it’s pretty informative. We tried the chat, and managers were pretty fast with their reply. It’s interesting that the Support is available in English. Banking: The website offers too few information about banking methods - we suppose, you can discover all the details only after you register. However, you can definitely use Visa/Mastercard credit cards, debit cards, and bank transfer! The maximum amount you can withdraw in a 24-hour period is €20,000. It’s not specified if this limit applies to your jackpot winnings. In any case, the withdrawal limit is pretty high. Casinohuone has its main audience in Finland and the current tendency isn’t soothing, as their popularity is falling since the highest peak in March 2017. Their incredible design isn’t enough for now, and probably they should expand the territories accepting more countries and adding more language options (at least, English). Check the graphic to see what we are talking about. Video poker: Joker Poker, Jacks or Better, All American. There are also two scratch cards games: Scratch Ahoy and Hole in One. You can play Casinohuone on your smartphone or tablet. The application is not required, you can simply access the website via your gadget’s browser. The mobile version is pretty convenient, by the way. The casino offers over 10 live gaming options. The selection includes Baccarat, Three Card Poker, Roulette, Blackjack, Casino Hold’em, Dragon Tiger, and Caribbean Stud Poker tables. They give you so many spins that you just might puke. The first deposit bonus: a 100% match, up to €100. Your 400 free spins are delivered in increments of 10, over the course of 40 days. The wagering requirements are 35 times the bonus, and your winnings from the spins must be wagered the same way. The bonus must be wagered within 14 days, and the spins - within 24 hours. There is also a bunch of nice offers and tournaments on the “Promotions” page, so check those out. Casinohuone is a pretty nice website. They offer a wide selection of games and a great welcome bonus. A single Finnish language option, and the absence of 24/7 support service, are the only serious disadvantages we managed to find. Well, let’s hope they will deal with these issues at some point. Click the button below and collect your massive amount of free spins.